At 88, Abraham Bursztein is seeing his place in the world rapidly disappear. His kids have sold his Buenos Aires residence, set him up to move to a retirement home, and disagree on how to handle his fading health. But Abraham survived the Holocaust, made a successful life in a foreign land, and isn’t about to quietly fade away. Instead, he plots a secret one-way trip to Poland, where he plans to find the Christian friend who saved him from certain death at the end of World War II, and to keep his promise to return one day. Comedic and poignant in equal measure, from Argentina to Spain, across Germany and finally to Poland, Abraham is on his own but also accompanied by the characters he meets along the way, who both help him and need his help. With its klezmer-driven score, evocative cinematography and fleet pacing, THE LAST SUIT approaches its weighty themes with a light touch that illuminates a serious story. And in its mix of Spanish, Yiddish, German and Polish it is a globe-trotting surprise, a late-in-life road movie with planes, trains and heart. "The film is comedic and poignant in equal measure, has a klezmer-driven score and a mix of Spanish, Yiddish, German and Polish languages spoken." 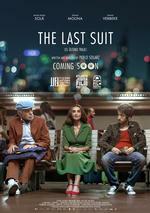 "A joyous, moving, surprising gift, Pablo Solarz's THE LAST SUIT enchants and delights." "A beautiful film, with magnificent direction and great performances." "Neat and resolutely starring Miguel Ángel Solá... the theatrical tone of his work brings a solemnity that works in contrast to the different characters he encounters in his journey."